This time, it was in Carlton Hotel. Small, simple, cosy affair with only 18 tables. The bride looked different from the other bride last Friday in Sentosa. Friday's bride looked more China Chinese than Korean. Today's bride looks more like someone you will find in a K-Drama. Prettier. Anyway, congratulations to Kenny and Hee-Young! Call me a dinosaur but this is one great song way back from 1976. If you have no idea what I am talking about, check out the Doc's video. There was also a remake in the 90s from the boyband 911. Singaporean guy, Korean girl, tying the knot @ a lovely candle-lit wedding on the lawn by Siloso Beach at Rasa Sentosa. The guy is my cousin-in-law (is there such a relation?). Sounds romantic? Yes, well, it could have been. There were a hundred or more guests at the beachside dinner buffet. Unfortunately, there were quite a few older folk who were invited too, and Siloso Beach was not exactly the most accessible dinner venue. There was quite a walk from the hotel lobby to the beachside, and the shuttle buses from the mainland weren't exactly very elderly friendly. Mumbled complaints aplenty. The setting at the beachside dinner was almost perfect. However, I think they forgot to put lights on the table where the food were placed. As a result, many were seen peering at the smoked salmon, trying to figure out what that dark mass was. Most of the time, I can't really confirm what kind of food was on my plate until it went into my mouth. As for the food, well, I've tasted better. I give it 2.5 out of 5 stars. All in all, it was a pretty unique experience. Kudos to the 3-piece live "band" who not only had to play throughout the dinner, but who also had to also compete with the din coming from the nearby OCBC beach party event about 50 metres away. Oh yes, the dinner also came with a complimentary 10 minute workout before and after the meal. I probably burnt off a couple of calories walking up and down a steep slope to the nearest car parking area. Just picked up Dad from the airport and sent him home. It seems that he has thoroughly enjoyed his 1 + 1 week of stay in Melbourne with Danny. Glad we made the decision to put him on this trip. He claims he did quite a bit of shopping at the flea markets there, so will check out his "loot" when we meet this weekend. Congrats Cel on your wedding! Great dinner event, nice food, lovely bride! Cheers! Not only did you gain a hubby, but you also found a long lost uncle/boss ... haha! This month alone there are 4 weddings to attend. Furthermore, GST is going to be raised to 7% soon, so its a good time to do a mini wardrobe update to maximise the returns! Weekdays are always good for shopping, especially in the men's section. Prompt service, and no queues at the fitting room. Only thing is the carpark is more expensive than usual. Anyway, went to do a little shopping with wifey on Tues after we got back the car (apparently they couldn't find anything wrong with it apart from the back seat which had fallen off and they managed to fix back). Finally decided on getting one from Zara. Its cheaper than all of the brands above but quality / cutting seems better (i.e. value for $$). So now, my wardrobe is a collection of mixed stuff, ranging from the el-cheapo $10 stuff to the most expensive one to date (Zara). Looking forward to more wardrobe updates in the near future! Ok, this entry will probably cost me a buck or two but I don't care cos I'm BORED. Its just before 10am here at the BK in Tiong Bahru Plaza. Just dropped off the car so I have about 3 hours to kill before meeting wifey for lunch. Just came down from the 4th floor cineplex. totally dark & deserted. Currently having a really slow drink. There's a few early birds here mostly in T-shirts and shorts. A couple of office wearers with laptops too. Probably insurance ppl. There is also a lady here with a super short crewcut hairstyle (like a BMT recruit) reading a book with "Emotional Rollercoaster" in its title. I wonder what's her story. I still can't decide if I should go to the library (was advised that it probably opens only at 1100) or somewhere else for window shopping. Wifey has a dinner appointment tonite. So on the way back, decided to take it easy and enjoy the drive. By the time I reached home and pulled into the basement carpark, Chris DeBurgh's "Lady in Red" was at full blast. It must have been pretty loud cos a number of residents were looking at me as I drove past. Must do this again sometime soon! continued from "Dad's Trip Down Under". Surprise surprise, Dad wants to extend his trip! Considering the fact that he was so insistent that he didn't want to go at all 2 weeks ago! Anyway, we are all glad that he is enjoying himself with Danny. Have told Danny to take more photos to share. I wonder how we ourselves will turn out after we hit 60. Will we be stubborn, mild, bitter, fierce, senile or still remain young at heart and keep up with the times? Will we still be able to remember old friends and make new ones? Although we can make a conscious effort but I guess only time will tell. 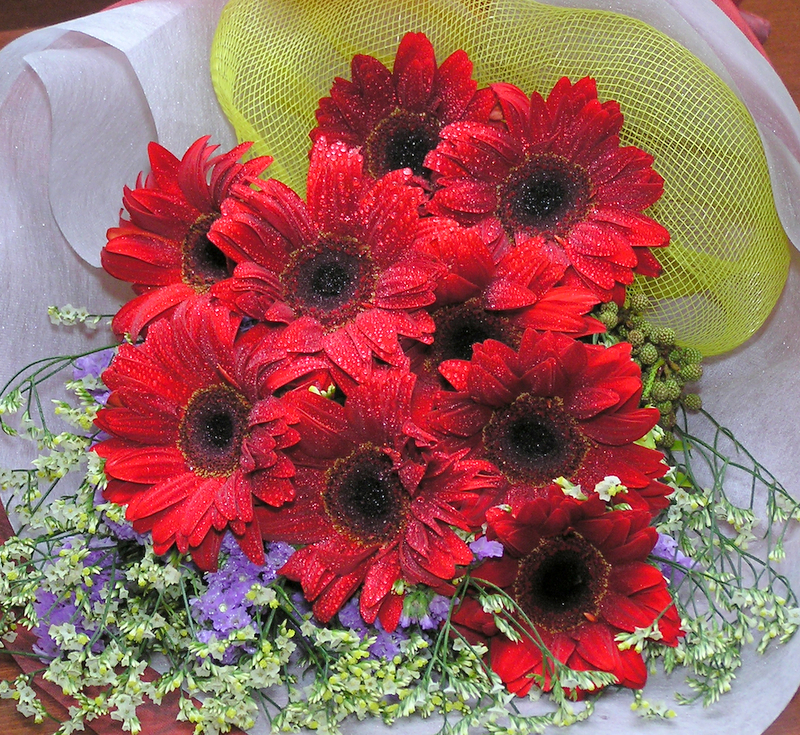 Bought a hand bouquet for wifey for our Special Anniversary (yesterday). After that we had dinner at Vis-a-vis. We were the only ones in the restaurant for the first half hour and so the only waiter around became our personal butler. Service is good (10% service charge + 1% cess) and the food was nice but a tad expensive. Reminds me once again why we somehow can never appreciate fine dining. Our Special Anniversary this year marks our 14th year together as a couple. We usually don't have any elaborate celebrations but its always good to have a "simple something" to remember. Anyway, here's to many more Anniversaries to come! Updated this Blog and optimised the display for screen resolution of 1024 x 768 using 3 columns. Simply put, it means I will have more space at the side to put other cool stuff! Have you ever had this irritating eyelid twitching thingy happen to you? Well, it happened to me (my right eye). And it happened for the whole day! It also didn't help that I had to sit through a super long meeting lasting almost 5 hours with lunch in between. BTW, it is still twitching away as I am typing this entry. Feel like giving myself a black eye now. Hope it goes away by tomorrow. Was looking at the leftover half pack of Japanese Vermont Curry and thinking of what to do with it when suddenly, inspiration struck. 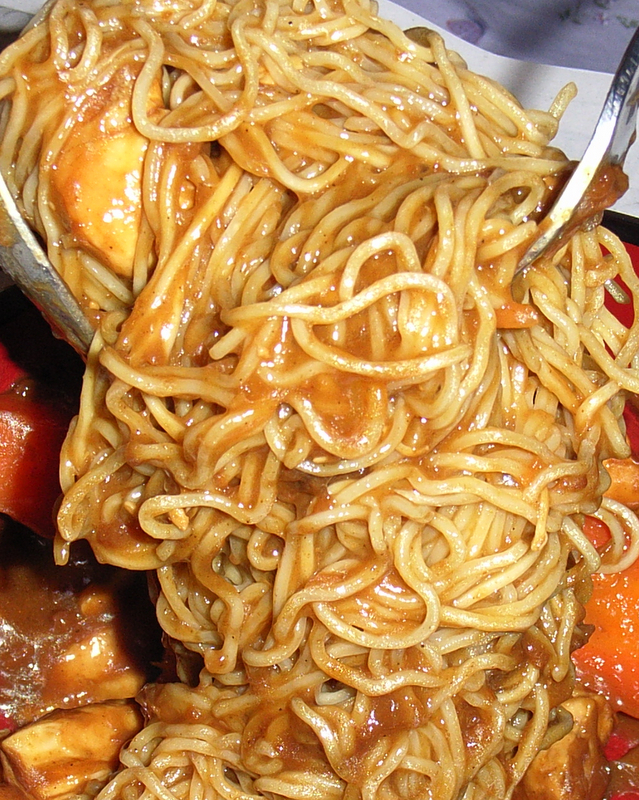 Hong Kong wanton noodles with Japanese Curry = slurrrp! Reduced carbo by just using carrots only without potatoes. The "HK Noodles" were from NTUC. The end result is what you see on the right. Delicious meal for two! Microsoft Internet Explorer 7 is out. Download through Windows Update. New support for Tabbed Browsing and other cool stuff are available. Used it to update this blog's layout and also to add feeds and stuff, so far its been reasonably stable. Its finally over, the tender preparation completed at approximately 1000hrs, a good 2 hours before submission. Now I am back at the hotel room (again) resting and getting ready for the flight back for the wedding dinner. Past midnight, sitting in the same looking hotel room in front of my laptop ... darn, these surroundings are getting more and more familiar with each passing day, not good. Tomorrow will be another full day of work before the Tender closes on Friday. Lets hope that there are no stupid last minute surprises tomorrow so we can at least catch a few hours of sleep at night. Friday is RTU and also a colleague's wedding dinner which I've promised to be there. As of now I am confirmed on the 1600 flight which will put me at the wedding banquet (luggage and all) at about 2045. My waitlist for the 1330 flight is still yet to be confirmed, although one of my "Gold Card" colleagues has already confirmed his. Wish me luck!